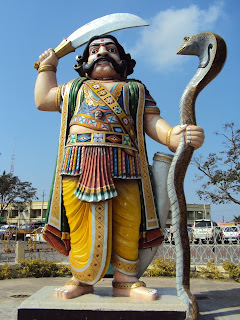 I leave my hometown Belgaum and reach Dharwar late evening where Pratap, Shyam, Ram, and Suraj were supposed to meet at the railway station to head for an exciting and divine trip into the land of Holy Siddhas. This time's traveled was too much - around 2700 kms in 6 days by trains, buses, tonga, autos, and by foot. The tickets were booked and everything just fell in place to connect with the places. This time it was a bit kind of risky because we had too much places to travel in few days, which meant we had to be moving and reaching the scheduled places on the right time and missing any train or bus would mean and entire change in the whole trip plans. We all met on April 5, 2012 at Dharwar, Karnataka, the common place from where we would travel. Three more sadhaks, Mayaji, Vanita ji and her daughter Priyal decided they would only be with us one full day in Mysore and that they would reach there directly. The ashram was called and informed of their reaching 5 am early next morning, while we had our dinner and hopped into the train to Mysore. The train reached Mysore the next morning at 7 a.m. and as we entered Nitayand Baba's ashram, we were happy to see that three sadhaks already there to spend a day with us. Mataji (Hassan Mata) was in her room and we quickly freshened up and booked a taxi to pick us up by 11 am. Mataji's sevak, Prahlad, was of great help to arrange things for us. We then were called for breakfast and Mataji came and sat with us. 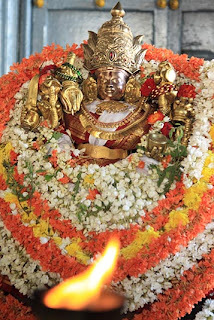 We fell at her feet and took her blessings. She talks very less and enquired few details about our plans and we told her. She just sat there observing and calmly looking at everyone as everyone had their breakfast. 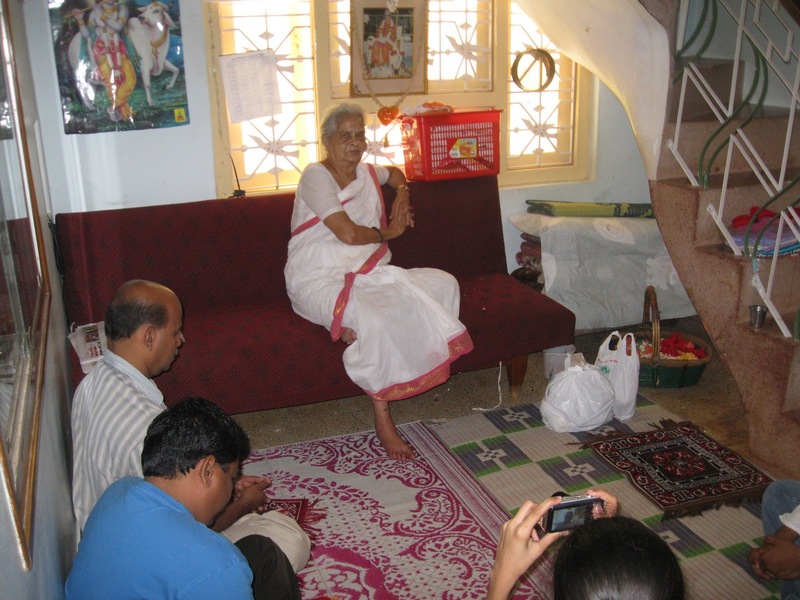 She sat on the same sofa that last time when i visited she had mentioned to me that Babaji and Ishanji had come once and Babaji was sitting on that sofa. As we had our breakfast of yummy idlis and chutney, Mataji, distributed biscuits to all (as prasad) and sat silently watching us all have breakfast. With her permission we took a few snaps and told her that we would like to spend some time at Swami Karim Peerji's samadhi, to which she asked us to proceed. We meditated for a while at His samadhi and then went to Nityananda Baba's temple where regular artis are done daily and meditated there for some time. Then we came back to the room and got ready while Prahlad showed everyone Swamiji's clothes and belongings. Swamiji and Hassan Mata ji had met Nitanand Baba in those days when Bade Baba stayed in Ganeshpuri. Bade Baba directed him to do tapas at a certain place in Karnataka and hinted to him about this current place. Swami Kareem Peerji did a lot of penance and finally settled down at the foothills of Chamundi Hills many decades back. 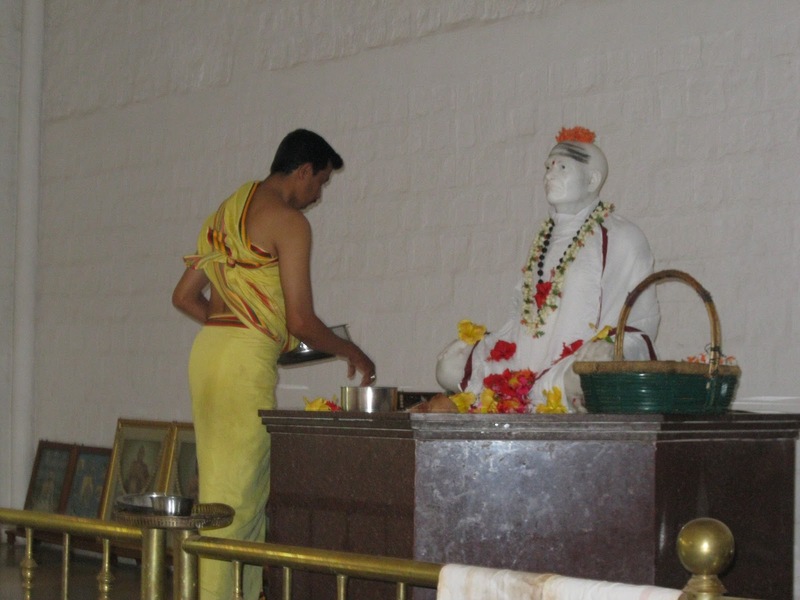 Swamiji and Mata ji had many devotees and many of Swamiji's devotees thronged from different places even today at His samadhi on account of the favors and healings they received from him. Mataji had narrated these incidents to me of meeting Bade Baba and the hard tapas of her husband Kareem Peerji. Though the names indicate Muslim names, it was an excellent living example of how Siddhas are beyond religion and other barriers. 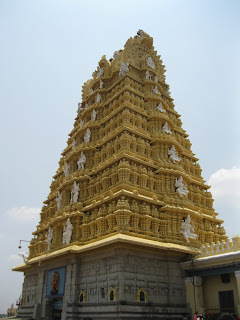 Soon, the taxi arrived and we headed towards Chamundi Hills because we had to then catch a train at 3 pm. In about half hour the taxi was circling and moving to the top of the hill. 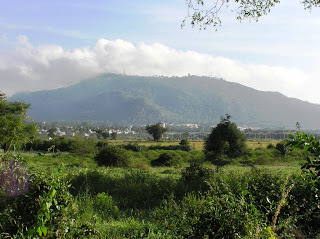 This entire hills is very vibrant with divine energies and an excellent place to spend time on. Years back having read Sadguru's enlightenment on this hill, i was always enchanted to this hill and had visited this place few times before. Best is to be still and absorbed while being on this hill. Reaching the top, the taxi was parked few meters down and we had to take a flight of steps of stone to reach the temple. The temple is of the powerful Mother Chamundi and just before the entrance is the huge statue of Mahishasurmardini, destroying the demon symbolizing the ego. We took passes and also took some offerings and queued up in line for the darshan. There was not much crowd luckily and we could get in pretty soon and also have an easy, less-pushed, darshan of the divine Mother. Coming out of the temple we sat just outside the garbagraha in contemplation. Soon, it was time to leave and we made out way back to the taxi, helping ourselves with fruit salad and juices. From there we went to visit the huge Avdhoot Dattapeethan Ashram, that is a very huge one, but unfortunately since it was odd lunch hours it was closed. Never-the-less, we made ourselves to some tender coconut water and headed back to Nityanand Baba's ashram. We quickly packed our stuff, had a little lunch on insistence of Mataji and took leave of her at about 1:45 p.m. The three ladies stayed back wishing us good for our journey. Excited and looking forward to the long trip into the land of Siddhas, we bid them goodbye and reached the station. The train was on time and we got on to it at 3 p.m.